Most of us couldn’t run five miles, let alone a half or full marathon. But even if you’re in good shape, running 13.1 miles can be a challenge. 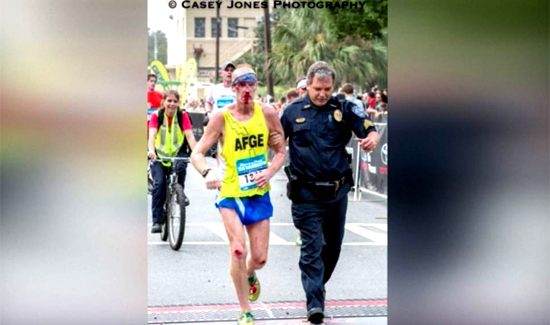 Recently, near the end of the Rock ‘N’ Roll Half Marathon in Savannah, Georgia, runner Robert McCoy collapsed. His will was pushing him forward, but his body wasn’t cooperating. He had exhausted his body, pushed it to the limit, and now was struggling to finish the race. Enter Sergeant John Cain with the Savannah-Chatham Metro Police Department. Close to the finish line, Cain helped McCoy make it the last 200 yards or so. “I went over to help render aid and he kept saying, ‘I’ve got to finish the race.’ I asked him if he wanted me to help him and he said yes,” Cain said in a press release. Cain, who has been with the department for 27 years, praised the runner’s resilience. “I am just glad I was in a position to help him do that. He in an inspiration to me, he is the hero in this story,” he said.